The Sandman makes his world premiere! 16 days until Spider-Man 3!! 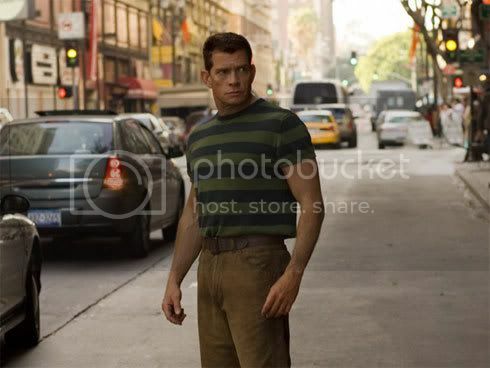 Yes, you'd think with everything else they redesigned from the comics for the movies, they'd change his shirt? lol. Yeah, the sand is yuck. I agree. I still remember that pic of Marko was like one of the very first pics of SM3 we saw. I can't help it, but with him as Sandman, I still think of the Mummy. Love the pics of Peter getting sand out of his mask, lol. 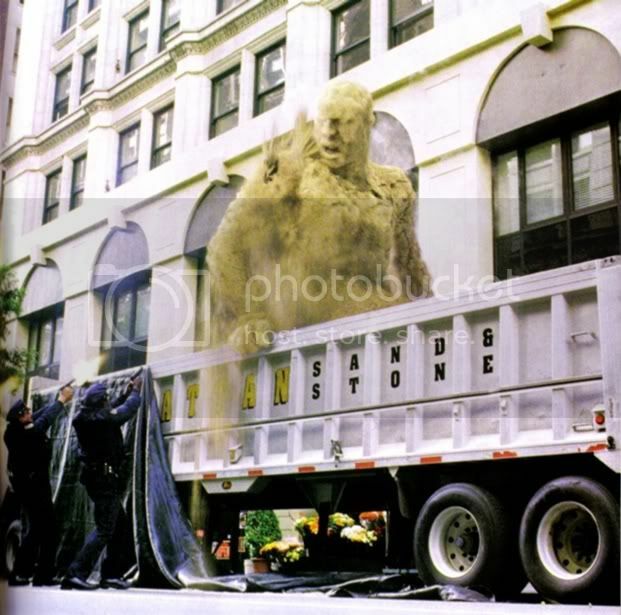 The Sandman makes his grand entrance, lovely. 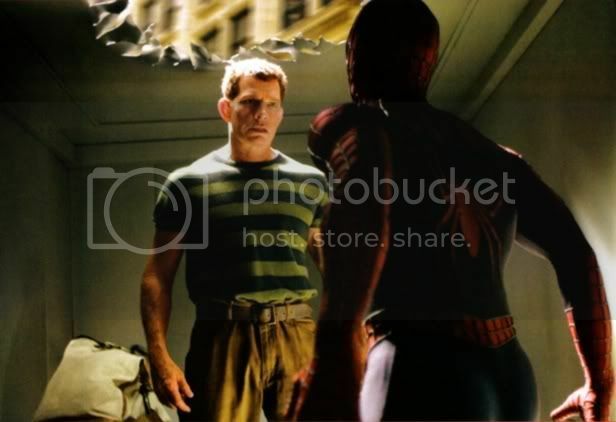 This is a new kind of villain that Spidey has to face because physical attacks don't even do much good against Marko. 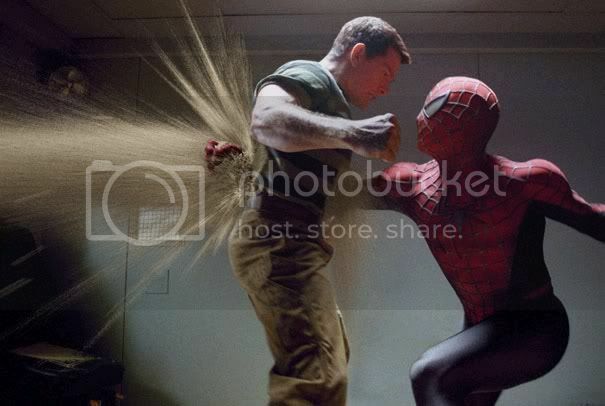 That pick of Spidey's fist going through him is a perfect example. Love the pics with Peter shaking sand out of his boot and costume. Some how, Peter must use his scientific knowledge in order to combat Sandman. May he do it before Sandy does a lot of damage. Exactly - Peter's going to have to get smart when fighting him. Brute strength just doesn't cut it. 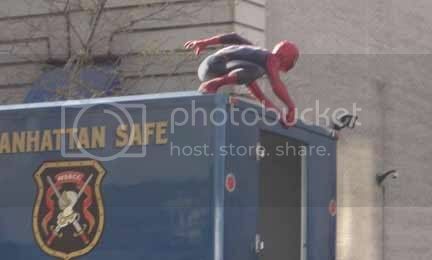 This is why I love Spidey. His suit gets torn, his mask comes off, AND he makes fun of the villans. That's good stuff right there! ANd I have to say that the effects for the Sandman look AMAZING! The poor guy really does have the bad luck, right? I think the Sandman stuff is pretty cool - I definitely prefer the Sandman arc over the final Venom stuff... although the black suit part is probably my favorite. Hey it's the return of Milkshake!Freddy Krueger, LOL. I'm catching up, Barb! Can't believe BW is almost over. Yay - you are catching up! Flint does make a pretty good milkshake, doesn't he? Hehe, I love Petey's mussed hair.